Donetsk—Separatists in Donetsk and Luhansk may have agreed on a cease-fire with representatives of Ukraine’s government, but they are still at war. That was the message at a rally for Donbass Liberation Day, the celebration commemorating Soviet forces’ victory over German troops in the region in 1943. 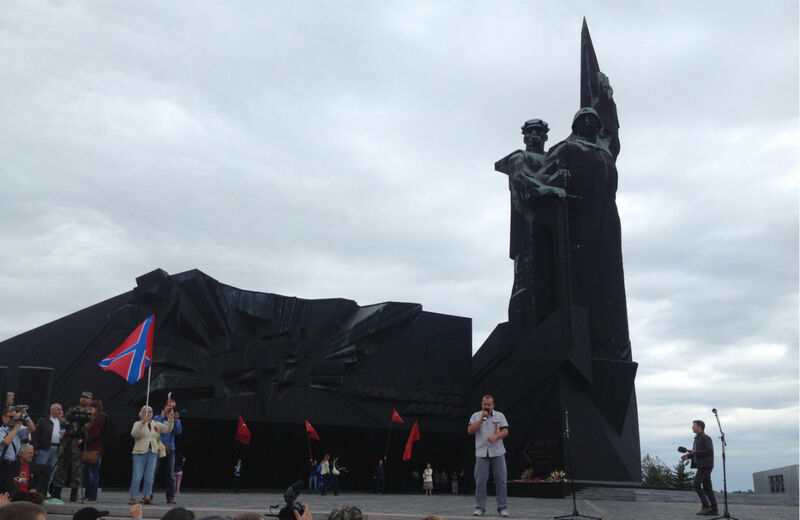 Speaking in the shadow of a 100-foot tall monument featuring a Red Army soldier and a coal miner, Alexander Zakharchenko, prime minister of the self-declared Donetsk People’s Republic, promised to repulse Ukrainian government forces, which he called the “same kind of invaders” as the Nazis, from the region. Two women held up pictures of a Malaysian Airlines Boeing like the one shot down here in July, with messages on the other side promising to “cleanse” the region of government forces. “This was a peaceful plane destroyed by the Kiev junta,” one of them said. Although the cease-fire agreed on Friday as part of a twelve-point peace plan saw a small lull in the fighting, it was broken a little more than twenty-four hours later when a Ukrainian checkpoint outside of the coastal city of Mariupol was hit by shelling. Ensuing violations of the cease-fire—evidence points to the rebels firing first—have showed that while Kiev stands to gain tactically from a pause in the fighting, its opponent is less committed. Analysts called the truce a politically useful fiction, and predicted the twelve-point peace plan will not produce results unless the situation changes significantly. Besides the Mariupol attack, the cease-fire has already been violated on multiple fronts. The International Red Cross reported on Saturday that it was not able to deliver humanitarian aid to rebel-held Luhansk, a besieged city without water or electricity, because of fighting in the area. And on Sunday, black smoke rose above Donetsk airport and heavy machine gun fire and the multiple explosions of Grad rockets could be heard, leaving two homes destroyed in the nearby village of Spartak. “No one here believes in any cease-fire,” said Natasha Kravchuk, sobbing on her way to try to extinguish her burning home there. Both sides insist they are observing the cease-fire and will only open fire to defend themselves. “We don’t shoot because we have a cease-fire. Meanwhile, [government forces] are taking territory,” said a rebel outside the Donetsk regional administration building, giving only his first name, Nikolai. According to a report by the Organization for Security and Co-operation in Europe, Luhansk People’s Republic fighters opened fire on government troops on Saturday, starting an exchange of machine gun, rocket-propelled grenade and artillery fire. Questioned by The Nation at the Donetsk rally, Zakharchenko blamed the Ukrainian side for breaking the truce, arguing “we gave them a chance, but they didn’t take it.” Yet he also said his forces had “liberated” the Ukrainian-controlled city of Telmanove the day before, even though the cease-fire precludes taking new territory. While the cease-fire is tactically advantageous for Kiev, for the rebels it’s useful only on paper. In July and the first half of August, Ukrainian troops had whittled away at separatist territory, taking back the stronghold of Slavyansk and attempting to cut off Donetsk from Luhansk. But backed by what Kiev and Washington say are Russian troops and armor—reports by independent Russian media documenting soldiers killed in Ukraine have undermined the Kremlin’s denials—the rebels decimated government forces at Ilovaisk and sent them into a large-scale retreat. On August 27, they took the town of Novoazovsk, opening a second front far to the south of Donetsk and threatening the city of Mariupol. The Luhansk and Donetsk people’s republics, now unified as “Novorossiya,” a tsarist-era term for Russian-conquered lands in southern Ukarine, “need to show their strength if they want to separate,” said another Kiev-based analyst, Yevhen Magda. “They need to keep pushing out the Ukrainian forces, they say that their forces are the ones doing this, and for this reason the cease-fire contradicts logic of the LPR and DPR,” he said. So why did the pro-Russian side agree to the cease-fire in the first place? “It was a first step to show we’re not terrorists. We don’t need this war. People are tired of war,” Zakharchenko said. But Mashovets argued the rebels’ agreement to the cease-fire was motivated primarily by political concerns. “The separatists needed it for the journalists, so they would recognize them as a party able to negotiate,” he said. Ultimately, the Kremlin may have leaned on Donetsk and Luhansk to come to the bargaining table. While Russian president Vladimir Putin is now in a good position to extract concessions from Kiev, he has also been feeling pressure from the West. On Monday, European governments approved a new round of economic sanctions against Russia, but delayed their start to observe the implementation cease-fire and the peace plan. The European Union “stands ready to review the agreed sanctions in whole or in part” depending on the situation in eastern Ukraine, European Council president Herman Van Rompuy said. “This is not possible right now. Recognizing the LPR and DPR would not be accepted in Kiev and in Ukraine as a whole,” Magda said. With fighting still breaking out on a daily basis, the only concrete achievement of the peace plan so far is the twenty prisoners of war that president Petro Poroshenko said have been released by the rebels. As if to highlight the cease-fire’s fragility, a series of intensive shelling was heard in the wee hours of Tuesday morning in the direction of the Donetsk airport, lighting up the cloudy night sky.